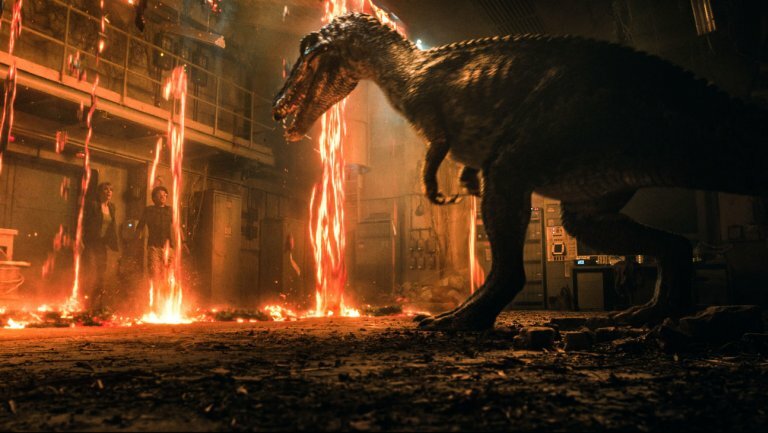 Fallen Kingdom, the second installment in the Jurassic Park “reboot” rebranded as Jurassic World (or fifth in the overall franchise) proves it’s still possible to inject a little rejuvenating freshness into a concept—people running around menaced by dinosaurs—that had seemed milked to the last drop. While 2015’s Jurassic World (despite being a big enough box office smash to greenlight sequels) was overly bogged down in nostalgic callbacks and recycled material, Fallen Kingdom goes in some refreshingly different directions, including fulfilling my biggest wish list for a sequel: get off the damn island already. We pick up three years after the fiasco at the revamped “Jurassic World” park. With the facility abandoned and fallen into ruin, the dinosaurs have once again been left to roam freely, but are suddenly threatened with being sent back into extinction when the volcanic island blows its top. Former park director Claire Dearing (Bryce Dallas Howard), who in the interim has turned into an impassioned dino activist, is approached with a rescue plan by the late John Hammond’s onetime business partner Benjamin Lockwood (James Cromwell) and his flunky Eli Mills (Rafe Spall), who have procured an alternative island sanctuary on which to deposit the dinosaurs. Claire joins in, recruiting her now ex-boyfriend, former Raptor wrangler Owen Grady (Chris Pratt) to grudgingly accompany the rescue party. But Mills and company’s motives turn out to be too good to be true, and when Claire and Owen learn the “rescued” dinosaurs are actually being brought back to the Lockwood mansion to be auctioned off to the highest bidder, and that Mills has also devised another souped up hybrid, the Indoraptor, for military application, they determine to throw a wrench into the nefarious plans. Fallen Kingdom starts out in standard-issue territory, but the Isla Nublar sequence is only the first half of the movie. It’s surprisingly not long before we’re leaving the island behind (from the looks of things, maybe for good). And while the plotline of animal traffickers snatching up dinosaurs with profits in mind echoes The Lost World, things are refreshingly different by the time the auction goes awry (don’t try to tell me you didn’t see that coming) and we climax on a dark and stormy night with dinosaurs stalking people through a gothic mansion. J.A. Bayona (The Impossible, A Monster Calls), taking over from Colin Trevorrow (who remains as a co-writer), brings a welcome dash of a horror movie vibe, especially in a legitimately creepy scene involving the Indoraptor stealing into a little girl’s bedroom, and also brings some sense of style (there’s a great shot of the Indoraptor silhouetted against the moon perched atop the gothic mansion that recalls something out of The Wolfman). The Indoraptor, the successor to the last movie’s souped up hybrid Indominus Rex (and partly created straight from its DNA), isn’t unleashed until the third act but makes a formidable “big bad”, and old friends like Owen’s favorite Raptor “Blue” and the indomitable, battle-scarred T-Rex return. There’s a twist involving Lockwood’s mysterious granddaughter Maisie (Isabella Sermon) that takes this franchise’s in-universe technology in further directions. Lest my praise get too effusive, while Fallen Kingdom breathes a little life back into the seemingly played-out franchise, it doesn’t transcend it. There’s the expected “comic relief” sidekicks and plucky children scurrying around (though Daniella Penada, Justice Smith, and Isabella Sermon are at least less annoying than they could have been), characters doing stupid things because the script says so, and various tired cliches. One wishes the movie had just let Claire and Owen still be a couple from the get-go and dispensed with the tiresome “estranged couple gets back together through survival situation” trope. For those weary of the hammy human villains this series arguably doesn’t need, here we get not one, not two, but three, the two-faced ringleader Mills, his mercenary henchman (Ted Levine) with a sadistic penchant for ripping out dinosaur teeth for trophies (no prizes for guessing how he meets his inevitable comeuppance), and the weaselly auction organizer (poor Toby Jones, who’s all-too-easy to typecast in this kind of role), all of whom might as well be twirling greasy mustaches (there’s one fairly laughably ham-handed moment where the camera closes in on Mills’ eyes widening as the auction bids soar; he might as well have had dollar signs for pupils). This series has never been renowned for great characterizations, but with various predatory dinosaurs running around, do we really need bumbling one-dimensional human villains hatching dastardly plans (and invariably getting themselves eaten for their trouble)? 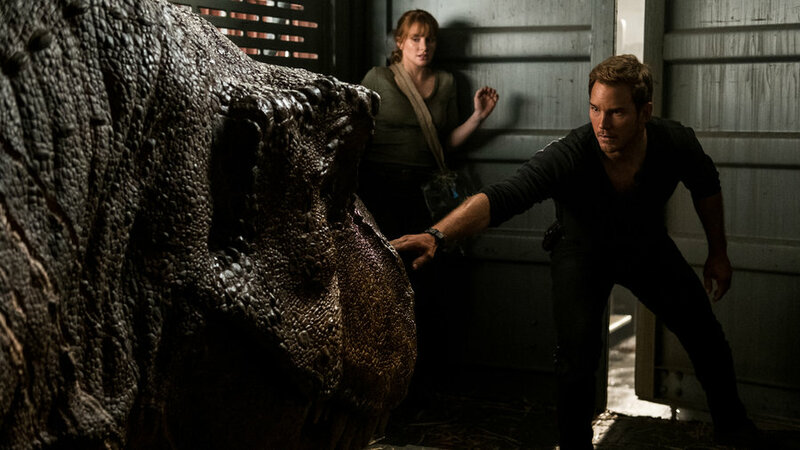 Chris Pratt is Chris Pratt, albeit maybe a little toned down, but Bryce Dallas Howard is refreshingly freed from the uptight corporate shrew caricature she was stuck in last time (no more outrunning a T-Rex in stilettos). In fact, things are almost switched around from last time, with Howard the take-charge heroine and Pratt as her sidekick. James Cromwell, making an inconsistent attempt at a British accent, gets a rather thankless role (he spends most of it in bed), and fellow elder thespian Geraldine Chaplin likewise collects a paycheck in a less-than-challenging part. Besides Pratt and Howard, the only returning series veterans are B.D. Wong’s Dr. Wu, who’s gone in full-blown mad scientist mode, and Jeff Goldblum in a cameo as Dr. Malcolm. While it’s always nice to see Goldblum again (who’s been popping up in various high-profile movies lately, including Independence Day: Resurgence and Thor: Ragnarok), don’t get too excited; he has only a cameo, doesn’t interact with the rest of the cast, and is not involved in the action. The conclusion of Fallen Kingdom leaves me with more anticipation for what the future holds than was true at the end of Jurassic World, and that’s a noteworthy accomplishment for a franchise which has long felt like it had milked its limited concept past the expiration date. 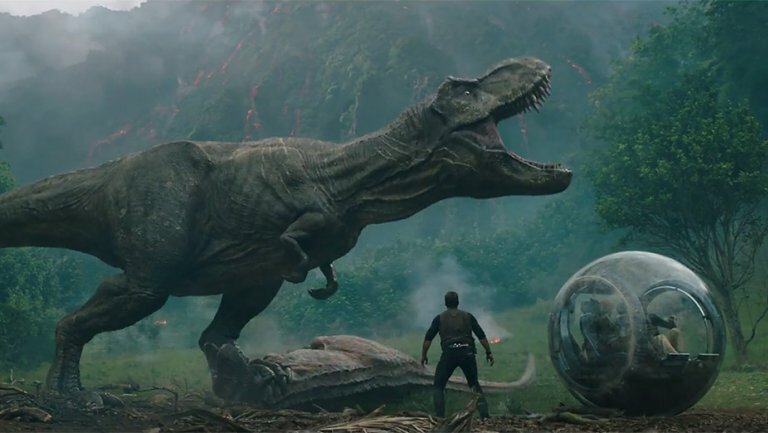 The sense of wonder and grandeur Steven Spielberg brought to the original film is long-dead, replaced with standard-issue running and screaming, and that’s not a trend bucked by Fallen Kingdom (which actually goes the furthest into horror movie territory of any entry yet). Still, it left me actually interested in the prospect of yet another Jurassic Park (or “Jurassic World”, as I guess we’re calling it now) movie, and that’s not something I’d have expected to say.